Kelly’s journey started in 2009, when she attended her first group cycling class at Nottingham Tennis Centre. She’d been dieting for a while with a work colleague who’d recommended the class as Kelly hadmentioned she also wanted to work on her legs. 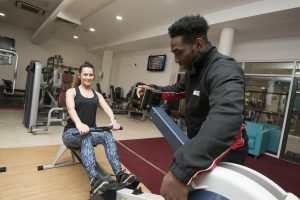 That first class was something Kelly will never forget – she had to leave after 20 minutes, as exercising at that level made her feel really ill. When the class finished, the instructor tracked her down and reassured her that everyone has to start somewhere and that she shouldn’t feel silly or self-conscious. For the next six weeks, Kelly attended the group cycling class once a week, and, as her fitness improved, she added to her routine until she was attending three times a week. It took six months before Kelly felt brave enough to go into the gym, but an inner drive to learn how to run drove her onto the treadmill. At first, she practised one-minute run/walk intervals to build up her stamina, then she felt confident enough to run outdoors. She ran her first park run at Colwick Country Park and loved it, and she was soon planning to compete in the Harvey Hadden 10k, which she completed in 54 minutes. Her hard work and commitment culminated in her completing the 2016 Robin Hood Half Marathon in 2 hours and 8 minutes! Through dedication and effort, Kelly has lost 5 stone, down from 14, and her size 16–18 clothes have been swapped for size 8s. Kelly’s happier and much more confident, and she’s made so many friends at the Tennis Centre. She’s more sociable and friends are often heard asking her advice on training and fitness. She takes her nephew swimming at Harvey Hadden Sports Village, which is something she wouldn’thave dreamed of doing before, as she didn’t want to be on show. She was the first on the trampoline with him at his recent birthday party too! If, like Kelly, you’d also like to work towards a fitter, happier you, check out Flexible Fitness today.